Fourteen UNB Fredericton teachers who received teaching excellence awards this year were recognized at a celebration recently where Vice-President Fredericton (Academic), Tony Secco, highlighted these fourteen as shining examples of the great teaching that is happening every day at UNB. This year's award winners are from the faculties of science, arts, engineering, law, business, and kinesiology. These professors were recognized by their peers and students as having done an outstanding job in the classroom. One student commented that his prof. "made the entire class want to get involved." They represent full-time senior professors as well as part-time instructors, some in their first five years of teaching, but common themes emerged around engaging the students, showing that they care, and tying their teaching to the real world. 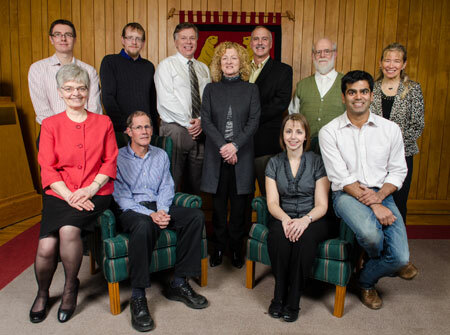 "These award-winning teachers are representative of the excellent teaching that goes on every day at UNB," Dr. Secco remarked. "They are also examples to others, encouraging all our faculty members to make that little extra effort, to use a fresh approach in their course, to innovate with a technology, to find a minute to encourage a student, to build connections that will relate to the students’ lives." Secco highlighted the importance of passion in the teaching equation - a central ingredient for teaching excellence. The Celebrating Teaching & Learning Excellence at UNB publication is now available from CETL, highlighting this year’s award winners, complete with a few handy tips and advice for the classroom. Copies may be requested from the Centre for Enhanced Teaching and Learning. Also present at the reception were many of the 24 UNBF nominees for the most recent Allan P. Stuart Award for Teaching Excellence.